Hermann Scherchen's debut as a conductor came in 1912, with a performance of Schoenberg's Pierrot lunaire. Although he remained an advocate of new music throughout his career, Scherchen was famous for his ability to excel in all kinds of repertoire, even the Baroque. He was interested in authentic performance practices in the Baroque and Classical repertoires long before it was fashionable to do so. His support of modern recording technologies probably contributed to his willingness to conduct the "pops" repertoire that occupies the first CD. The six French overtures were collaboratively recorded in April 1958 by the American Westminster and French Vega labels. Here's an example of a French ensemble that still sounded French, before personality and national style were sapped out of orchestras, a phenomenon that fatally accelerated in the late 1960s and 1970s. Some of the playing is scrappy, but there's no mistaking the peculiarly nasal sound of a French orchestra from this era, and the musicians obviously care about these overtures as if they were national treasures – which they are. When was the last time that anyone outside of France played Louis Maillart's (who?) Les Dragons de Villars ? These overtures are not played as "throwaways," and the idiomatic performances, while driven, retain their charm. Heavy bass accents in these overtures turn out to be caused by the maestro's excited stamping on the platform! 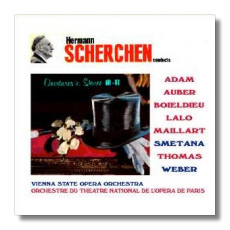 The Smetana and Weber works were recorded in Vienna. The Vienna State Opera Orchestra made more than their share of ragged-sounding records, but here's one that shows them at their best. Scherchen, true to form, pushes them to their limits in the overture to The Bartered Bride, yet the Orchestra hangs on tight. Scherchen includes a jaunty fanfare between two of the sections, which was new to me but very effective. The Freischütz Overture is among the best I've heard – definitely on a par with Toscanini's famous reading with the NBC Symphony Orchestra. On the second CD, the Beethoven concerto is stylish. This is one of those June-December concerto readings in which a young, intelligent, and sensitive pianist meets a veteran conductor who really understands the tradition behind the music. 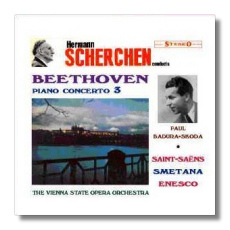 This is tradition without cobwebs, however, and together, Badura-Skoda and Scherchen humanize this concerto, and ensure that it remains vital and gripping. The couplings are an odd juxtaposition. "The Swan," from Carnival of the Animals, is tenderly played by the VSOO's cellos, not by a soloist. The Moldau receives a most leisurely reading, and just as one begins to wish that the river would flow a little faster, the section depicting the Moldau in moonlight comes along and is completely disarming. Enescu's always entertaining Romanian Rhapsody #1 gets a good workout here. ReDiscovery releases are available over the Internet at www.rediscovery.us; their service is fast and courteous. The asking price for most of their CDRs is only $15, and that includes shipping and handling. The releases look endearingly homemade - no labels on the CDRs apart from a handwritten catalogue number near the spindle hole, and rudimentary (yet effective!) cover art and release notes. The music's the thing, though.